Today's post comes to us special from Buzz Mooney. Buzz is a longtime reenactor, maritime history enthusiast, and personal friend. 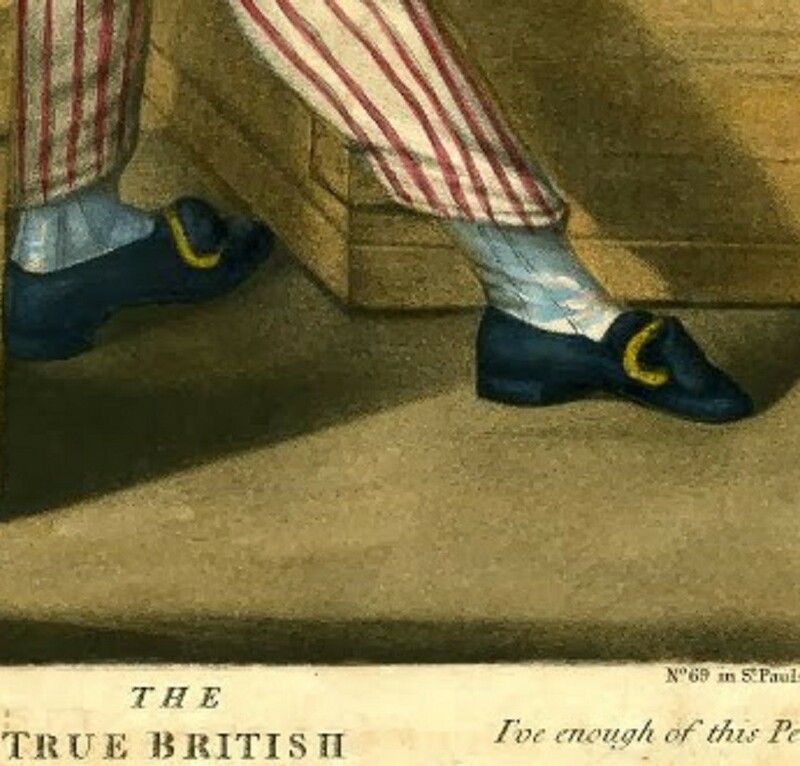 I decided to see what I could find, to illustrate or verify the notion of shoes worn “sailor fashion”. Were there period sources that mentioned this, and was it shown in period illustrations? 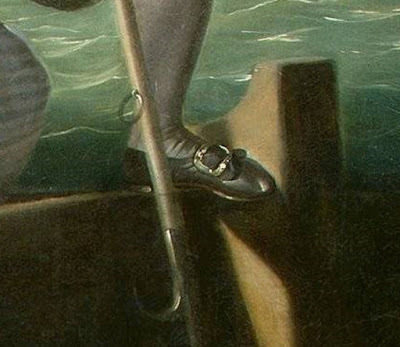 When did sailors wear their shoes in this manner, if at all? The article didn’t cite any sources, so I had to explore this notion on my own, as best I could. I posted an inquiry on Facebook, to see if any of my naval re-enacting friends could shed some light. Fortunately for me, my list of friends includes the authors of two respected blogs on the subject of period Sailor attire; Kyle Dalton, of British Tars; 1740-1790 and Ben Bartgis of the related Napoleonic Tars; 1790-1820, as well as some of the best naval re-enacting units in the US, including HMS Acasta and Ship’s Company. The Cuthbertson book told me the style was commonly recognized as a sailors’ fashion in 1768, which suggests that it had been common for some years, so that at least gave me a fairly early confirmation, and the images I found showed that the style continued into the 19th century. Normally, the chape strap would be passed under the frame, but over the chape, and then passed down through the chape, (to the left of the center bar) and either folded back and tucked under, or laid against the foot, under the tongue strap. The tongue strap is then passed upward through the frame, (to the right of the center bar) and is drawn snug, with the forked tongue of the buckle passed through holes in the chape strap. In the “trained” fashion, some illustrations seem to show the tongue chape simply allowed to hang loose, without being tucked under the left end of the frame, but others seem to show both straps drawn forward, with the tongue strap either loose, above the frame, or passed through under it, and drawn forward. 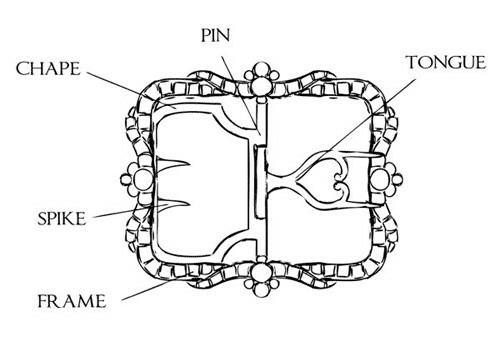 Other illustrations seem to suggest, however, that the buckle may be installed in an unusual fashion, with the tongue strap buckled first, then the chape strap passed upward through both chape and frame. Ben Bartgis suggested the possibility that training might serve to speed up the process of putting on the shoes, and this method seems to me to be particularly suited for that. Before showing my experiments with my own shoe, I’ll show the illustrations which I felt showed both the variety of approaches, and the duration of the fashion, as I’ve been able to trace it, thus far. It appears both straps are trained forward, with both passed under the frame. I’ve found this to be a somewhat challenging style to mimic, but also the one most likely to keep the shoe securely buckled to the foot. 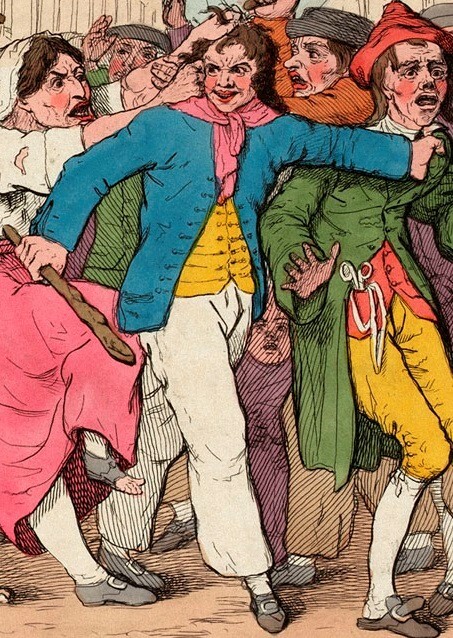 In this detail from Gillray’s "The Liberty of the Subject" (National Maritime Museum, 1779), we see a sailor with one strap (presumably the tongue strap , as I find it’s easier to buckle the shoes with the tongue strap to the outside) trained forward under the frame. Note that the Tailor being pressed into naval service has a loose strap, which may be in imitation, or may simply be because he’s being roughly handled. Next, we have “Poor Jack”, By Bowles and Carver (1790). In this case, we see both shoes, with one loose strap, drawn over the frame. Be sure to visit Napoleonic Tars: 1790-1820 for Part Two. The conclusion, Part Three, can be found here. Where, in 18th century documents, do you see buckle straps called latchets? 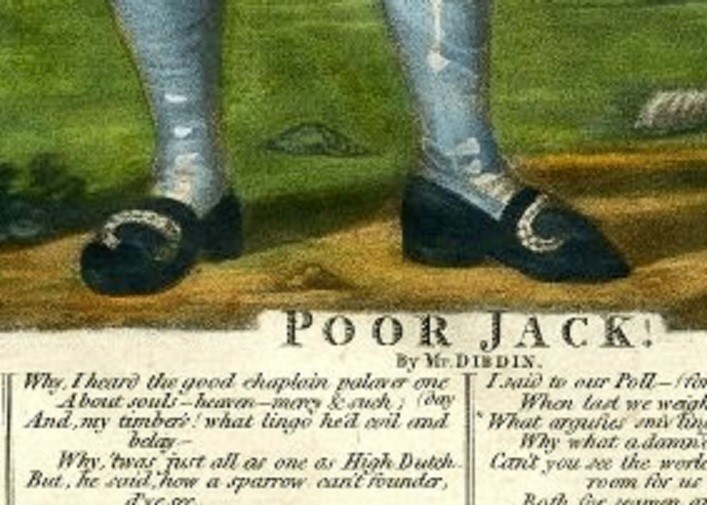 Note that the man being pressed is a tailor and has flattened the back of his shoes, as well as leaving a strap loose. A tailor climbs upon his work table to stitch. Possibly he kicks off his shoes every time.